6th Sump discovered at the end of Pozo Azul !!!!! 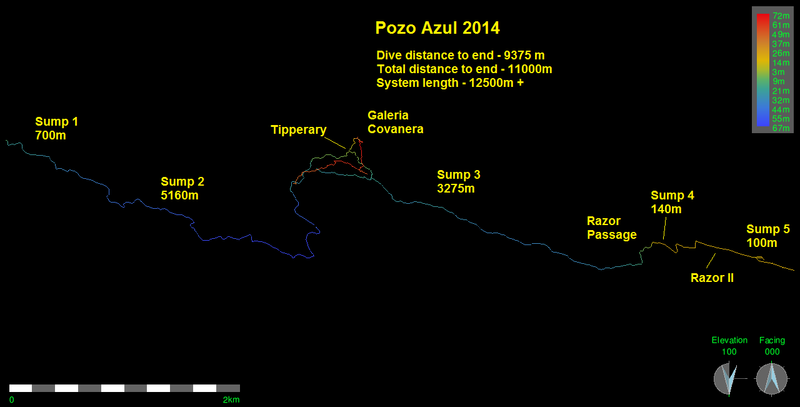 Pozo Azul is currently the longest cave dive penetration in the world. The 9.4km+ of diving required to reach the furthest point from the single entrance is accumulated over 5 sumps, the longest of which is 5160m. Sumps 2 and 3 are actively linked and are in fact one long sump of more than 8km in length. In 2009 the Pozo Azul team finally passed the immense 5160m (-70m) long Sump 2 to reach a dry gallery called 'Tipperary' and a third sump. In 2010 the team explored a total of 3650m of submerged tunnels in Sump 3, to a maximum penetration of 2965m (-40m) from Tipperary. 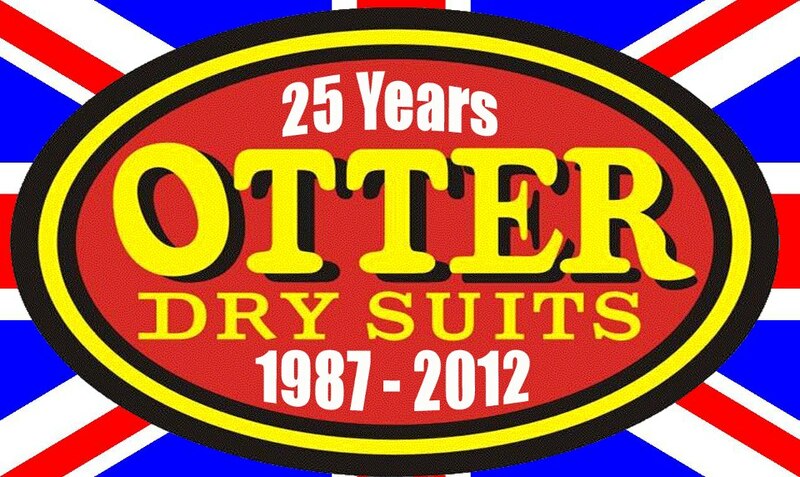 A total record breaking distance of 8825m of diving. In 2011 the team passed Sump 3 after 3275m to find an active streamway with numerous cascades leading to a fourth sump. To reach this point 9135m of diving was required, from the entrance. 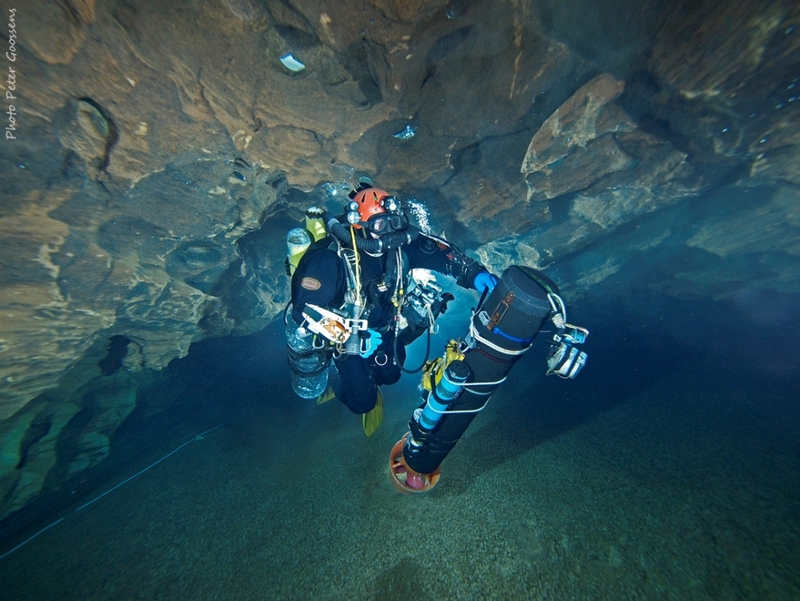 2014 saw different tactics used to progress at the end of the cave, when the divers changed into wetsuits to combat the dangerous situation with the sharp rocks. A fifth sump was discovered several hundred metres beyond Sump 4, this was also passed to ongoing river passage. The total dive distance to the end is now 9375m and the total cave passages including dry passages has shot up to more than 12,000m. 2015 A solo push at the end, after an epic 3 day trip, a 6th sump was discovered and dived. This continues.................. Nearly 1000m of new dry passages also discovered. Does this cave never stop ? En el año 2009 el equipo que explora en el Pozo Azul completó finalmente la inmensa longitud del segundo sifón (5160m, -70m) llegando así a una segunda galería aérea que fue llamada “Tipperary” y, seguidamente, a un tercer sifón. Durante el año 2010 este mismo equipo exploró un total de 3650m de galería inundada en el tercer sifón, con una distancia máxima recorrida desde el comienzo del mismo en Tipperary de 2965m (-40m). Se batió así un auténtico record con 8825m buceados. En 2011 el equipo completó el tercer sifón tras haber recorrido 3275m, encontrando una galería aérea por la que discurre el río formando numerosas cascadas tras las cuales se encuentra el cuarto sifón. Desde la entrada hasta este punto se bucean un total de 9135m.